The Weiss König (White King) was one of three books commissioned by Emperor Maximilian I (1459-1519). The book chronicles Maximilian’s life and represents his court as an ideal chivalric society. Maximilian is unusual in adopting the woodcut as the medium for large-scale schemes of patronage. Woodcut was cheap and therefore less prestigious than painting or tapestry, but Maximilian was short of money and woodcut also had an advantage of allowing multiple copies to be made for distribution around members of his court. The Weiss König linked Maximilian to prophecies foretelling the coming of a Friedenskaiser (Emperor of Peace). In this image, the young Emperor is hunting deer with his courtiers when a messenger hands him a document containing news of a victory. The Weiss König remained unfinished at Maximilian's death but proofs survive. There were 236 illustrations planned, with painter Hans Burgkmair, Maximilian's chief designer from 1508, designing about half of them. The blocks were cut by Jost de Negker and a team of assistants between 1514 and 1516. Large-scale projects like these helped to raise the status of blockcutters. Documents survive showing that Jost de Negker was effectively publisher in overall charge and his assistants were paid an annual salary which worked out six times more for each block that that paid to the designers for each drawing. 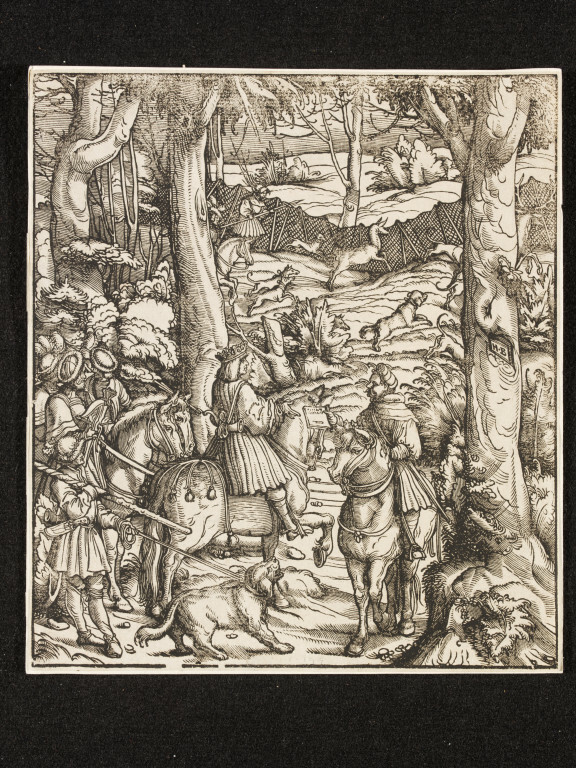 A hunting scene. Plate 153 from the book. Commissioned by Emperor Maximilian I as one of three works supposedly chronicling his life (Freydal and Theuerdank being the other two). Plate 153 in Kaiser Maximilians I Weisskunig. Stuttgart: W. Kohlhammer, 1956. The work printed from 236 or 237 blocks in total. 223 original blocks (remainder lost) in Vienna, National Bibliothek, each ca. 22 x 19.5 cm. 1st edition: Proofs, printed between 1513 and 1518. Watermarks: High Crown, imperial eagle, small orb, chalice. 2nd edition: Published for the first time, 123 blocks by L. Beck, Joseph Kurzböken (Kurzböck). Vienna 1775, the remainder in 1779 by S. Edwards in London with a French title Tableaux des principaux evenements de la vie et du regne de l'empereur Maximilien I ... 236 woodcuts in total. 3rd edition: Schultz, Wiener Jahrbuch, VI, 1888, 236 woodcuts, 13 of them reproductions after proofs. E. Tross, Der Weiss-Kunig. Huit planches manquant dans les editions de 1775 et 1779. Paris 1869. Wie dem Weyssen Konig potschaft kam, das die Crobaten geslagen weren. Illustration to the Weisskönig, from a set of 237 illustrations to text telling The history of Emperor Frederick III and his son Maximilian I. Woodcut. 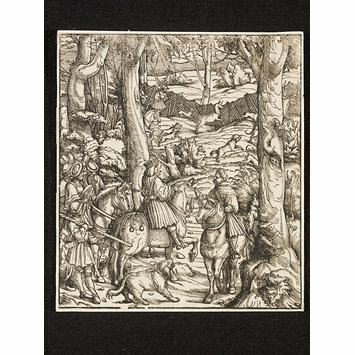 Hans Burgkmair; Germany, proof printed 1513-1516. Landau, David and Peter Parshall. The Renaissance Print: 1470-1550. Yale University Press, 1994. Kaiser Maximilians I Weisskunig. Stuttgart: W. Kohlhammer, 1956. Victoria and Albert Museum, Department of Engraving, Illustration and Design & Department of Paintings, Accessions 1920, London: HMSO, 1922.
a strong impression, some wear top edge; WM doesn't correspond to states I-III in Kaiser Maximilians I Weisskunig. Stuttgart: W. Kohlhammer, 1956; is imperial eagle similar to that reproduced on page 145 of this same vol.